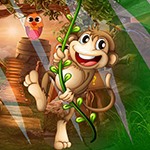 G4K Jumping Monkey Escape is another point & click escape game developed by Games4King. In this game, a jumping monkey was living very happily in a beautiful and gorgeous village. One day, that jigging ape got unexpectedly stuck in a house. Your duty is to rescue the jumping monkey. It will help you to find the hidden clues in the form of colours and numbers and to locate the items in the environment to save the animal. Find them all and solve all puzzles to free the jumping monkey. Good luck and have fun! An easy one this time, without difficult sliders. why is there sound playing on home page? Got stuck with the paper that has word, BEAR, and arrows on it. Will take too long to look through "Walkthrough" video. Comments and hints from other players will help those of us that get stumped. Too many keys though, too many rooms. Other than that, a good game.